The Vocational Rehabilitation Association of Canada (VRA Canada vracanada.com) is the leading national organization representing and advocating for vocational rehabilitation professionals. Since 1970, VRA Canada and its members have worked to remove barriers for individuals to return to work and achieve the best possible outcomes following a work-related injury or health event. Vocational rehabilitation assists persons living with functional, psychological, developmental, cognitive and emotional impairments and / or health conditions in overcoming barriers to employment, or to accessing meaningful participation in society. Vocational rehabilitation professionals take a multi-disciplinary and multi-faceted approach to the clients’ needs. Vocational rehabilitation professionals have a unique set of knowledge domains, experiences, skills, interventions and strategies as they exercise their scope of practice. Some practitioners do part of the job, vocational rehabilitation professionals do it all. Vocational rehabilitation professionals work in many different environments such as hospitals, rehabilitation centres, government agencies, insurance companies, as well as public and private organizations. Vocational rehabilitation is a highly sophisticated profession, underpinned by a belief in the dignity and worth of all people and is delivered by experts requiring unique multidisciplinary skills, experiences, education and training. The vocational rehabilitation process is interdisciplinary by nature, and may involve functional, biopsychosocial, behavioural and / or vocational interventions. It demands due diligence in professional ethics and adherence to the law in practice, reporting, decision making and application of policy. 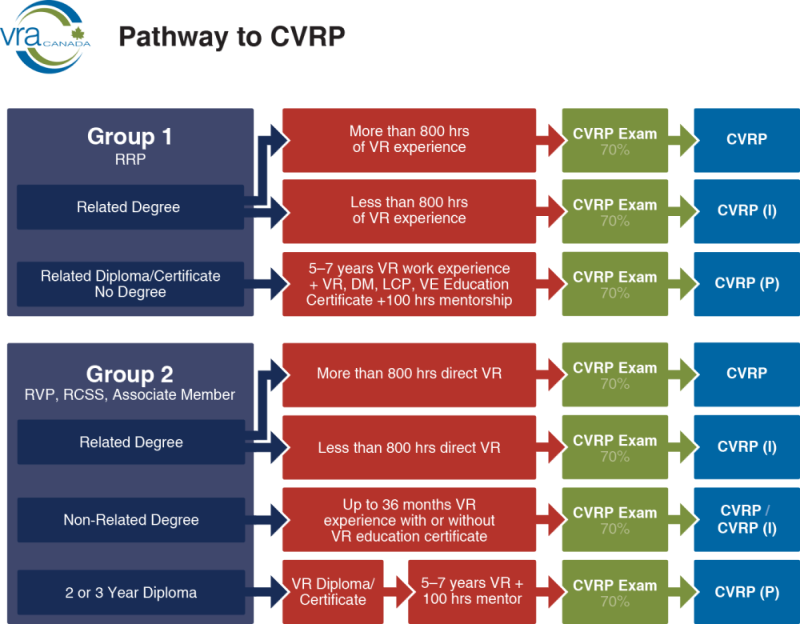 VRA Canada’s Online Learning Academy provides extensive, high quality, current, peer reviewed educational materials to aid in the training of individuals new to the field of vocational rehabilitation, to provide continuing education to those already working in the industry, and to assist individuals who are preparing for the College of Vocational Rehabilitation Professionals (CVRP) certification examination. ** Vocational rehabilitation professionals are the gold standard and the best choice for assisting with return to work. ** Vocational rehabilitation professionals are client-focused and are always working in the best interest of their clients. ** VRA Canada members are the best of the best in their field of work.